If you haven’t noticed, lately I’ve been bringing some of my favorite older recipes back to life by retesting and improving them, then updating the photography. If you’re new to Ambitious Kitchen then this recipe is most likely new to you, as it was originally published in 2014. 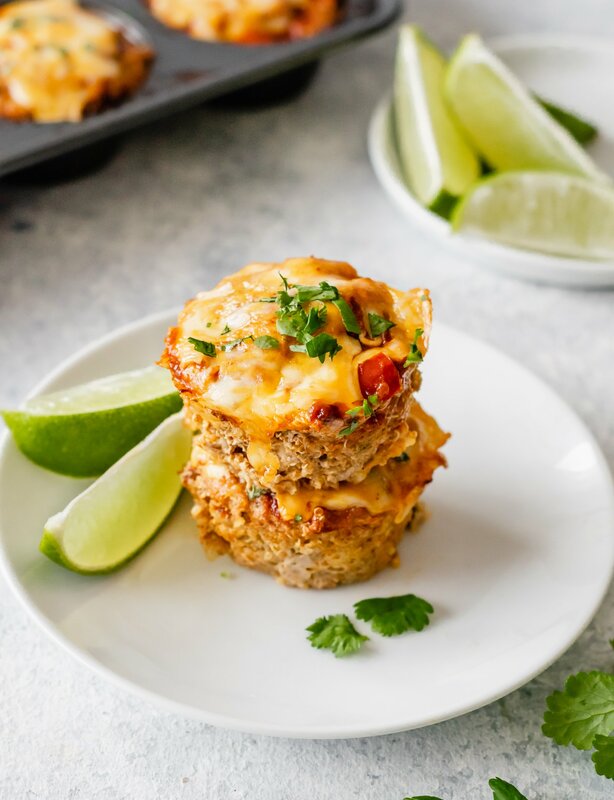 SAY HELLO to these gorgeous MEATLOAF MUFFINS! 2. You know it’s going to be healthy. 3. Bring on the Hispanic flavors! 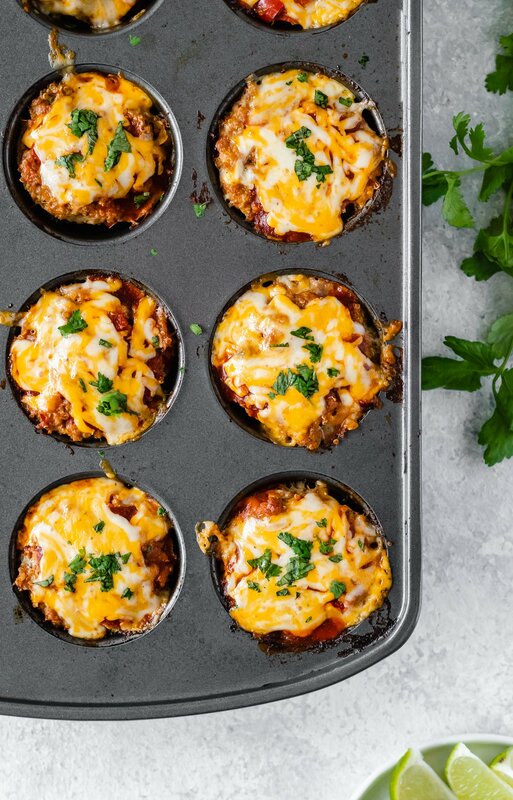 I love these muffins because they are perfectly portioned and great for re-heating and enjoying with a salad or fresh veggies. They’re also great as a midnight snack. I mean, I would know. How you make them is fairly simple, too: Just saute garlic, onions, and peppers, then cook up some quinoa. Mix all the ingredients together in a big bowl with some spices and place into muffin cups to bake! Who wouldn’t love these? Oh and don’t worry, these babies aren’t dry like some of the meats on the internets. Instead they’re perfectly flavored, moist, and topped with cheesy LOVE plus a spoonful of your favorite enchilada sauce. My favorite part of these mini meat loaves (besides being cute) is that 2 muffins are low in carbs (which means you can also fill up on a side of sweet potato fries). 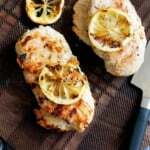 TIPS: You can definitely use either ground chicken breast or ground turkey breast in this recipe, both will taste amazing. If you have trouble finding ground chicken, you can always ask your local butcher. I asked the butchers at Whole Foods if they would grind up a pound of chicken breast for me and they were more than happy to. 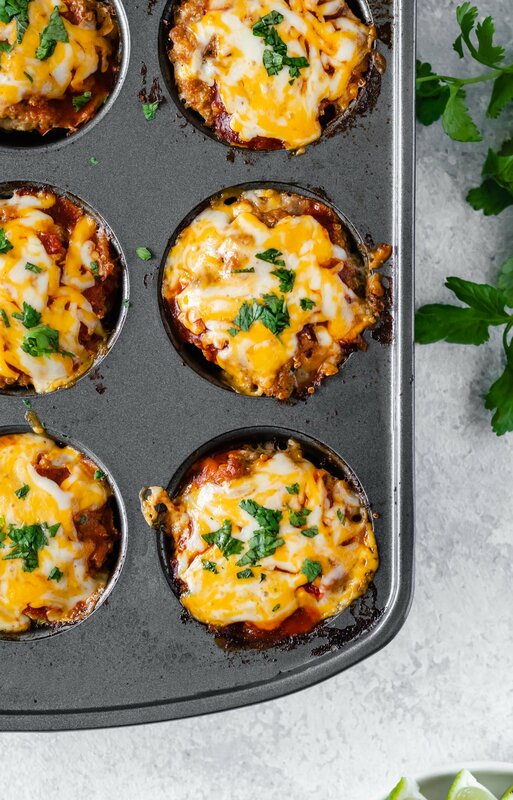 I hope you love these meal-prep meatloaf muffins. They’re perfect for snacking, making ahead for meal prep or just doing something a little different for your dinner. A healthy, lean deliciously-moist meatloaf packed with quinoa, veggies and protein! This gluten free meatloaf is FULL of mexican flavor! To cook quinoa: In a small saucepan, bring water and quinoa to a boil. Cover, reduce heat to low and let simmer for 15 minutes or until quinoa has absorbed all of the liquid. Remove from heat and fluff quinoa with fork; set aside to cool for about 5 minutes. While the quinoa cooks you can move on to the next step. Preheat oven to 350 degrees F. Spray a 12-cup muffin tin generously with cooking spray. Heat olive oil in a medium skillet over medium heat. Add garlic, onion, and bell pepper. Cook for a few minutes or until the onions have softened. Transfer to a large bowl to cool for a few minutes. Add cooked quinoa, cumin, oregano, chili powder, hot sauce, red pepper flakes, cilantro, salt and pepper and half of enchilada sauce (you'll reserve the rest for topping the muffins later). Next stir in ground chicken (or turkey) and egg whites and 1/4 cup of the cheese. You may need to use your hands to ensure all ingredients are well combined. Use a 1/4 cup measuring cup or an ice cream scoop to add meatloaf mixture evenly to muffin cups. To make meatloaf less spicy and kid-friendly, omit red pepper flakes and hot sauce. If you can't find ground chicken breast, you can ask the butcher to grind it for you at the grocery store - they always do this for me at whole foods. Another option is extra lean ground turkey! Feel free to use 1 egg instead of 2 egg whites. 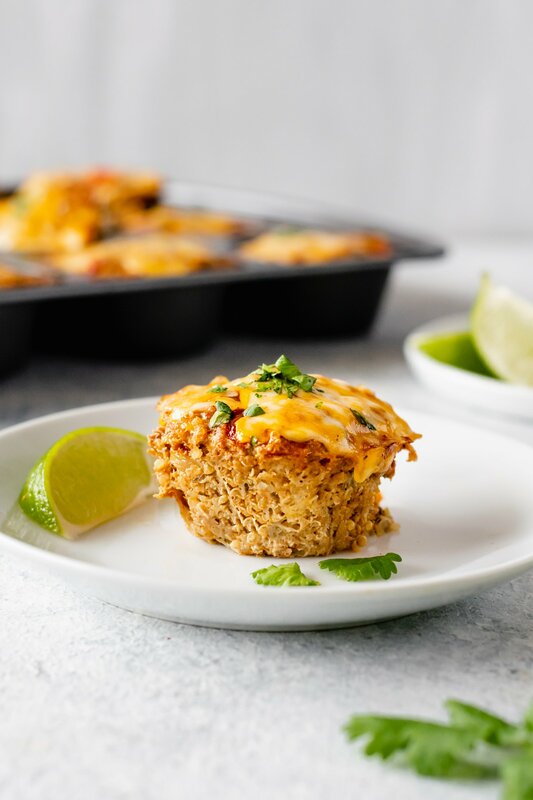 94 Responses to "Cheesy Chicken Quinoa Enchilada Meatloaf Muffins"
If this winter doesn’t convince you to leave Minnesota, nothing will 😉 In all seriousness, I know what you mean. 9 years ago my husband and I took a risk and moved to Wisconsin where we didn’t know anyone and I didn’t have a job. It ended up being a great decision and well worth the risk. Whatever it is you are thinking of, go for it!! Love this recipe! Definitely going to try this one out with my husband. I never would hav ethuogh to make meatloaf into muffin tins but it makes more sense than a whole loaf that we try to eat for leftovers and then eventually end up tossing. I think so! I would just individually wrap them in plastic wrap! Would these work with TVP? Wow – what an ingenious combination of flavors!! I can’t wait to try these. Love this idea!! These look great for my toddler and my husband. Love these flavors, this is right up my alley! Had these last night – awesome just as written! One request: Could you please make the photos smaller? They overwhelm the website! This looks like an amazing recipe! I would like to make it this week. I am curious what enchilada sauce you use? I love the Hatch brand from Whole Foods! It’s so amazing! Could you possibly make this using a green enchilada sauce? Can you use green enchilada sauce instead.? OK, I feel like an idiot for asking this, but I don’t know that much about baking and I was wondering if when I stir in the ground chicken (or turkey) and egg whites and 1/4 cup of the cheese, is the ground meat completely raw at this time? No pre cooking required? I made two batches of these this week. With the first batch I followed the recipe as written and they came out really great, but I missed the amazing flavours of your spicy pumpkin sour cream enchilada sauce which has become my favourite go-to enchilada sauce, so for the second batch I used that instead and they were fantastic! Awww I do love those enchiladas! These were really delicious, easy to make and certainly fun to present. I used ground chicken and egg beaters for the egg whites. The leftover muffins froze great so I could pull one or two out at a time for a quick lunch or dinner. This recipe is another keeper! I made these today during my “meal prep sunday” madness that I started on. And let me say: these are the bomb dot com. I am an enchilada junky. Like could go to the Mexican place and order them for lunch and dinner seven days a week kind of junky. 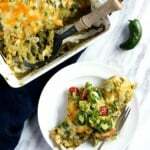 So when I searched for “healthy enchiladas” last week and these popped up I figured what the heck. I made them to your suggestion this time, but next time will probably try venturing out with some verde sauce. 😉 THANK YOU SO MUCH. I owe you big time for this lifesaver! You’re also my new favorite blog. I’m so glad you enjoyed them! The verde sauce sounds spectacular! Yummy! Very tasty! Thank you! Just made and ate these for my dinner. I used lean ground turkey and the Go Veggie cheddar shreds I discovered in your mac n cheese recipe. I haven’t made the mac n cheese yet, but I will. Love the low calorie, healthy meal this is. Thanks again. 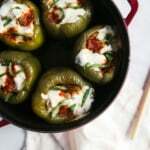 Just made these for dinner and they were FANTASTIC!! I used lean ground turkey breast and one egg instead of egg whites. They were definitely a hit! I’ll be making them again for sure! This was killer!! The only thing I did differently was, used spicy chicarron’s (pork rinds) about 1/4 cup crushed instead of quinoa because I’m doing low-carb, used 1 whole egg and did a mix of both a verde and red enchilada sauce. I also did it in a loaf pan and used ground turkey. This is a WOW!! Super moist, great flavor!! Already have it in my recipe book. Thanks a million!! I am officially obsessed with these!!!! They took me much longer to cook through (like double the time) but they were definitely worth the wait!! Already looking forward to leftovers for lunch tomorrow!!! Thanks for the great recipe!!!! Should the ground turkey be cooked when you are in step 3? Nope! It will cook in the oven. What can i use in replace of the enchilada sauce? Salsa? Tomato Paste? Have everything at home but that!! If I wanted to make this as actual meatloaf and not muffins how long would the cooking time be? Great question. I would start at 45 minutes. I think it’s important to have a meat thermometer so you can make sure it cooks completely. What could I use in place of enchilada sauce? We do not have that here in Canada . I so want to make these! Nice recipe, which I’m looking forward to trying. Hope it’s not out-of-scope to comment that fatty meat isn’t a problem re: health. The fat is actually necessary and helpful in absorbing the nutrients from meat and other foods. And crucial for our bodies to run well, including maintaining a healthy weight. If anything should be cut out of this recipe or others, it’s added sugar (such as in the enchilada sauce). There’s lots to be read on how fat became the dietary demon based on plain falsifying of data, if you’re interested. I only add this because you’re clearly committed to giving people good, healthy advice! I’ll be trying this recipe with dark meat ground turkey because it’s so flavorful. Thanks! Hi Jenny! I’ve actually read up a fair amount on healthy fats – completely agree that the diet industry painted a false picture of fat as all “bad.” I personally prefer leaner cuts of meat in my recipes to keep them a bit lighter. As far as added sugars go, I use my homemade enchilada sauce (here) that is very low in sugar – I try to be very mindful of sugar content and opt for all-natural sources wherever possible! In this recipe, and others, I give people the option to use their own enchilada sauce for ease 🙂 Thanks for your thoughtful comments! Hi there, I can’t wait to make this but what do you do with the garlic? Mince it? I am so happy that I stumbled on to this recipe. Delicious, healthy, easy and not in need of any tweaking! I’m so glad you found this one! Beef will work here too. Enjoy! Correct, it is completely raw, then it all bakes together. This was the first AK recipe I ever made years ago, and it is still one of my favorites! We are all about enchiladas at our house!! These are adorable and look AMAZING! Yes, absolutely! Glad you like them! They are as delicious as they are cute!!! Right?! Cutest meal prep meatloaves! I enjoyed these a lot! I skipped the first step of cooking the garlic/onions/peppers because I like some texture, and they turned out great. Thank you for the fun, easy, healthy and satisfying recipes! I just made this recipe and they are delicious. A question – do you think these will freeze well? Looking forward to trying these! 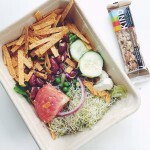 We are trying to move towards a plant-based diet. Any suggestions on replacing the meat with black beans or other plant based protein? I made these with veggie ground round and they were great! Given veggie ground has the texture of cooked meat, pack them extra tight so they don’t fall apart. 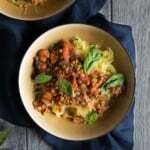 Lentils may work best if you want to stick with beans. These were delicious, nutritious and the presentation was perfect. This was delicious!! Used your 10 min enchilada sauce too! This recipe is delicious. Our family loves it. The presentation is perfect! 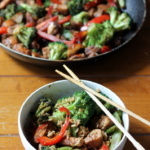 I want to try a non spicy variation to this recipe. I have guest who are not keen on chili, spicy, taste. What variation Sauce would you recommend with ground turkey? I am so excited to try these. I have had this recipe on my list for awhile. I thought I had ground turkey and it turns out I don’t would it be a major faux pas to use lean ground beef or canned chicken? Lean ground beef should be just fine! This was absolutely delicious! Thank you for sharing! 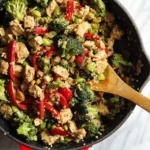 Any chance of substituting meatless crumbles for the ground chicken/turkey? Sure, that would probably work!